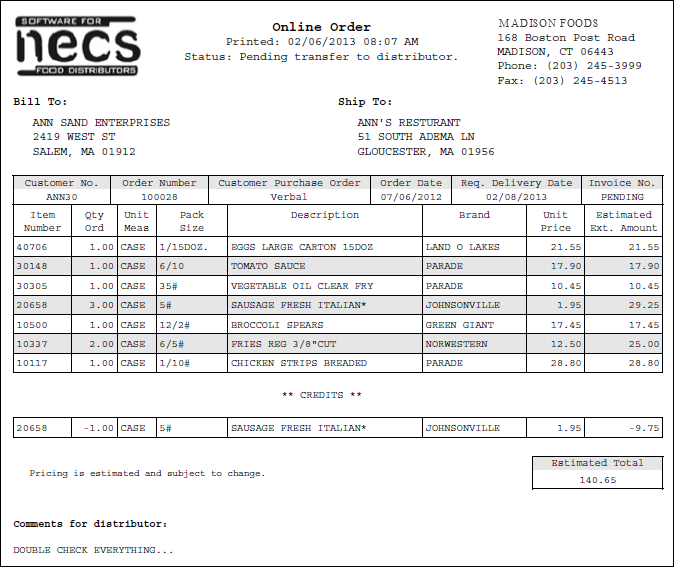 The most important feature of entrée.NET is online order entry. The process is streamlined, fast and easy. NECS took great care when designing this experience for your users. Features include speed to keep up with your users input, allowing the customer to tailor the layout of the screens to their needs, and a shopping cart that always is present. Using their sales history with our Standard Order concept, we've made it easy for them to remember all the items that they'll need. Searching for items in your Product Catalog and Order Guides is always available from all sections of the order entry process. Customers may search by Item Description, Class, Brand or Item Number. The Order Guides option allows the setup of an unlimited number of targeted lists of items to make the ordering process easier and faster for each customer or DSR. They can be defined to provide specialized lists by department such as frozen foods, dry goods, canned goods, dairy, meat, seasonal, day of week, etc. 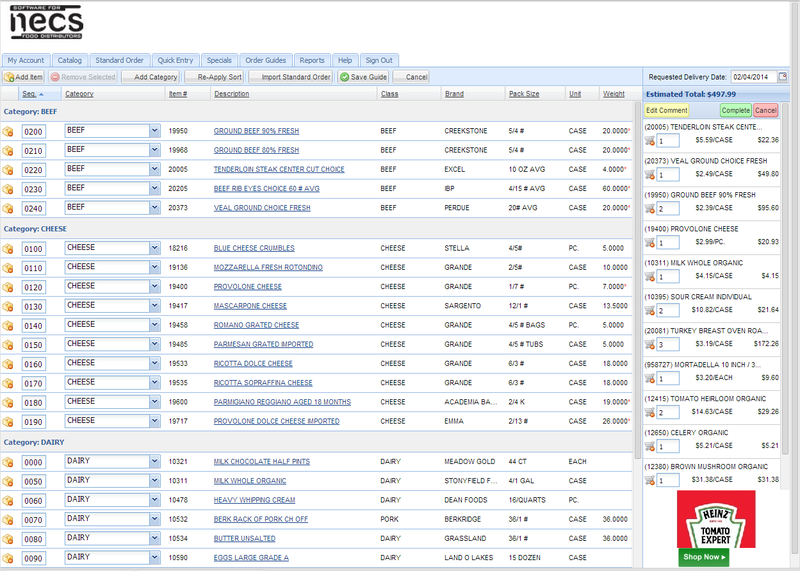 For each Order Guide defined, you can select specific items and the order sequence in which they will appear. 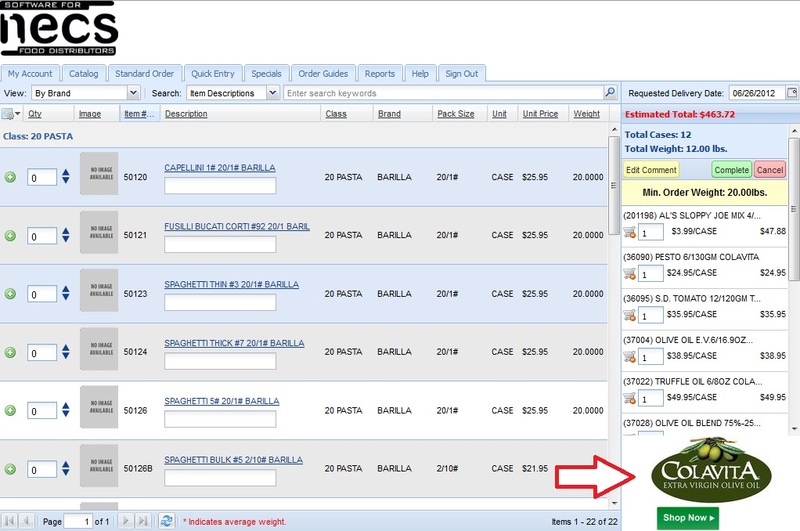 To make defining Order Guides even easier, you can import an entire item category or the customer's Standard Order, and then just remove the items that are not applicable. You can create Order Guides for each business location, making them perfect for franchises or multi-location customers with varying needs. Once created, your Order Guides can be easily copied, edited or deleted. The users Shopping Cart is always viewable on the right side of the screen. In the Shopping Cart, all the items ordered will be displayed. 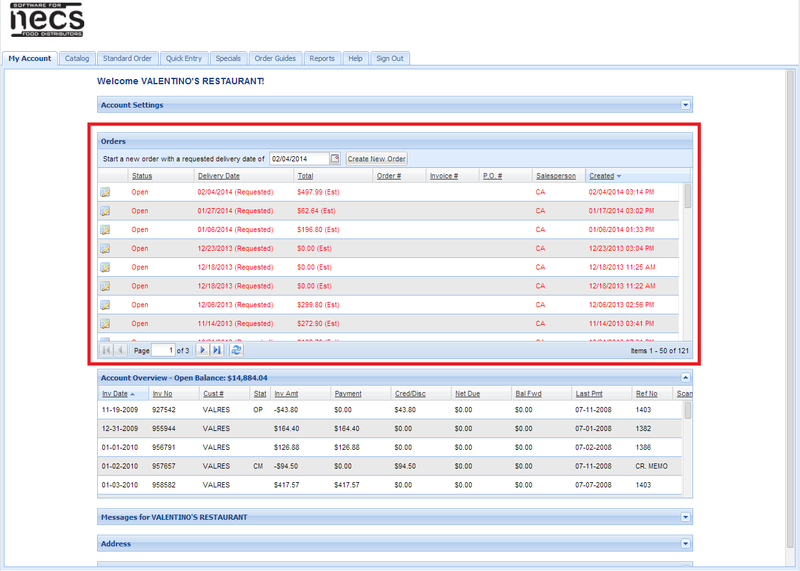 Users can easily remove items, as well as see an Estimated Total of their order. Note that for catch weight items, the estimated total will use the average weight of the item in the price calculation. They can also change their requested delivery date, cancel the order, edit comments or complete the order from the Shopping Cart. The Featured Brands advertising option allows you to define the Brands and Vendors you would like to feature when a customer or DSR (logs in to place an order. The customer benefits by seeing items that they might not normally have exposure to and taking advantage of sale pricing that they might not have been aware of. 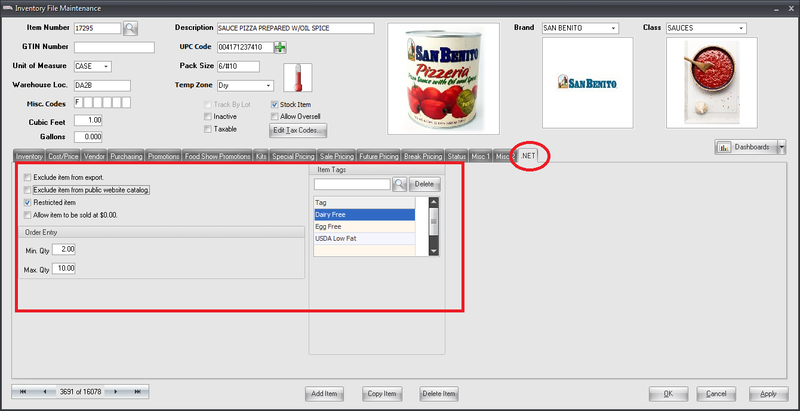 You can define unlimited Brand's to feature, and they will rotate as the user is placing their order on the bottom/right of the screen. When the user clicks either the "Shop Now" button, or anywhere on the Brand image, entrée.NET will then display all items of that Brand for the user to review and select to order. Everyone loves a special and entrée.NET makes special pricing and promotions easy for your customers to find and take advantage of. Also the "View Specials By" drop down menu allows customers to select "All", "Featured" or a specific item class defined with specials. Customers can view an informative list of all your specials, more detailed information about featured specials as well as see special offers as they enter their orders. Specials can also be emailed automatically to your customers. 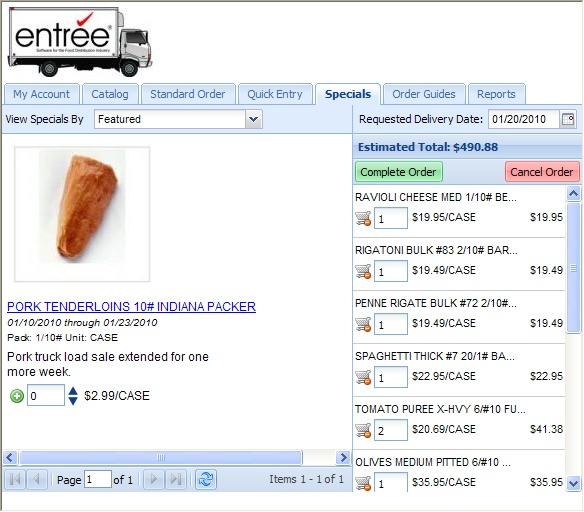 When using entrée.NET, you can easily manage special situations with your inventory. For example, items can be defined as "Restricted" so that they will not appear when placing an order, searching for items, etc. However if a customer has a restricted item defined in their Special Price/Standard Order file, they will still be allowed to purchase it. You can also enforce the purchasing of minimum and maximum quantities, and also create special exceptions to this rule by individual customer. 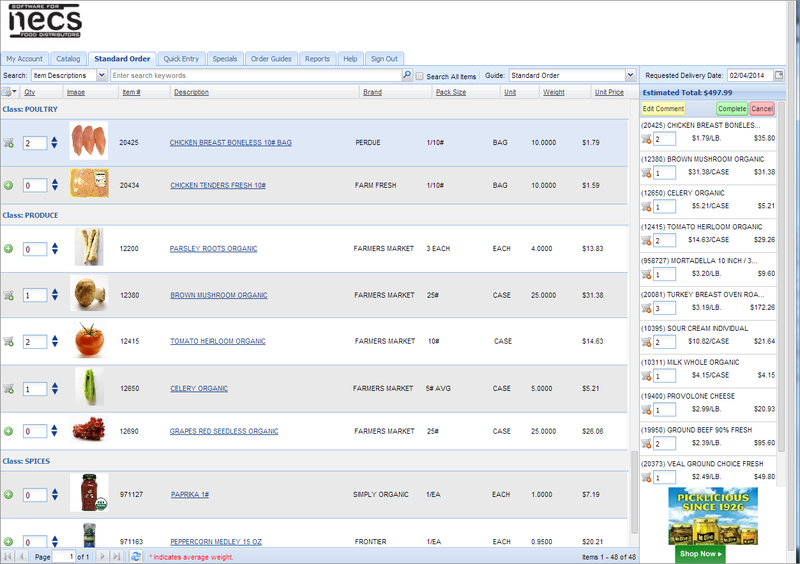 Other situations include excluding items from your public website catalog and allowing items to be sold at no charge. After an order has been completed, the entrée.NET system will send an email confirmation to the customer, the DSR and your system administrator. The format of the email notification can be customized and it includes all the line items purchased with quantities and pricing. It will include an "Estimated Total" as the exact quantities and/or catch weights to be delivered are not known at this time. When calculating pricing extensions on catch weight items, the system will use the items "Average Weight".